Buy all three essential Healthcare Ethics Consulting ASBH publications and receive an even greater discount. 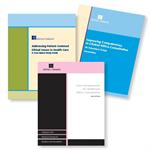 The Clinical Ethics Consultation Bundle includes the following ASBH publications and provides an essential foundation identifying core competencies, improving those competencies, and the application of competencies through the presentation of complex clinical cases. The Bundle includes all three ASBH publications and provides an essential foundation identifying core competencies, improving those competencies, and the application of competencies through the presentation of complex clinical cases. Members save $15. Additional discounts are available on orders of 21 or more. ASBH members save $15.00 USD or more!